Schools and universities often use FSS products wire partitions for sports equipment storage lockers as well as maintenance equipment storage. Sports equipment storage lockers from FSS provide instant, versatile, and safe storage for many schools and colleges across the nation. Due to its heavy duty construction, our lockers are stronger and more durable than sheet metal lockers. The tightly woven 10-gauge wire mesh doesn’t cause the potential injuries that sharp, exposed unprotected mesh or expanded metal lockers can. Our wire mesh allows for full visibility and unrestricted circulation of air, light, and heat so it has minimal, if any, interference with fire suppressant systems in high-rise residential or office buildings. Our sports equipment storage lockers are also perfect for industrial and commercial applications to help reduce inventory shrinkage caused by employee theft. 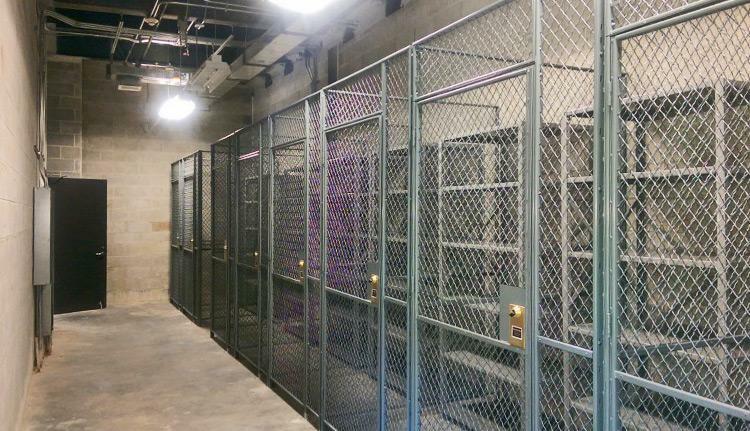 Wire mesh lockers provide security, yet visibility not offered by sheet metal products.